On Tuesday, the fourth day of the course, the subject was `Still Lifes'. This is one of Charles specialities where he combines flowers with a variety of other objects. They aren't pure flower paintings but paintings with flowers in them. The duck was added later and some rearrangement took place. Initially Charles began with Schut Flamboyant 250gsm 50% cotton paper. This was at the request of his wife who particularly likes the effects created on this paper, which is extra rough. Charles started with a silhouette at top. Draw some and then paint, make sure white shapes are large enough. No details initially. Draw with brush, not over much pencil work. Be very careful with white flowers not to make the details too dark. Tonal values were explained once more. Charles considers them far more important than colour. If you get the tonal values right that's half the battle. Make more light and shade in lighter flowers but do the negative shapes first. This is the only way to get form in lighter flowers. Make the shading quite light otherwise it won't look right. 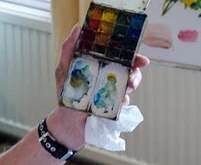 He then began painting using Cadmium Yellow + blues for his greens. A little Raw Sienna added to warm them up. The brush was worked in an up and down motion using colour straight from the paint wells. By this time it was obvious he was not happy as the paper did not seem to be taking the paint very well. After a pause he decided to scrap it and start again! Fortunately Judy was absent at this time and only returned when the second attempt was well under way. The Schut disaster - as Charles says `mistakes are part of it'! He actually progressed further than this and it wasn't looking good. This time the paper was Schut Noblesse which he compares favourably to Fabriano. As time had been lost he really got a move on with this painting. After the drawing was completed he started using a No12 brush. This is the largest one I've seen him use and he did switch to smaller sizes later. While Charles was painting almost vertically he indicated this was not his normal preference, which is to have the board at 35/40 degrees. It was interesting to note how he dealt with the three groups of small coloured flowers by reducing the number and making the individual blooms larger. When he painted the pepper he used Alazarin Crimson + Cadmium Red plus Cobalt Blue for the dark areas. He said Cobalt is his favourite blue. The lemon was painted with the cast shadows Raw Umber. The duck was Cobalt Blue, Raw Sienna, Viridian and Cerulean. After this he painted the sky followed by the background. He added an Avocado on the right hand side. He painted a yellow pepper on the left hand side and added another brush just touching the original one but at a different angle. Finally some small areas were overpainted. Then he stopped. After lunch the students selected a still life arrangement of which there were several spread over the two rooms. I elected to attempt the one that Charles had done. Later at 6pm a critique took place. It was decided to go to the National trust property Trelice, a few miles from West Pentire, on the Monday of Day Three and paint plein air. After it was discovered the house and grounds did not open until 10.30am, Charles decided to have an improvised question and answer session. What developed came about when Mick Carney asked a question regarding how to keep paints wet, as his experience was they tended to dry on him. Actually it was a fascinating discussion since it seemed to spark Charles off and gave him the chance to emphasize some of the things he holds dear and which he believes many students fail to grasp. During his initial thoughts he mentioned the Australian artists Robert Wade and David Taylor, both excellent watercolourists, although I don't recall the exact context. The Charles Reid way, described in his many books and demonstrated in his videos, is to dip the brush into the water pot, roughly one third of the length, and then give it a good shake ( or two) before digging it into the paint. Don't take too much water out by wiping on a tissue for example. He suggested we think of the brush as a fountain pen water + paint. Don't stroke onto the paper and avoid the errors of too much paint not enough water and the reverse. This is one of the keys of getting things right. Place paint adjacently and don't smooth things out! Be cruder! Charles also demonstrated the way to see if the paint is the right consistency. Hold the box near vertically and if the paint runs it has too much water. 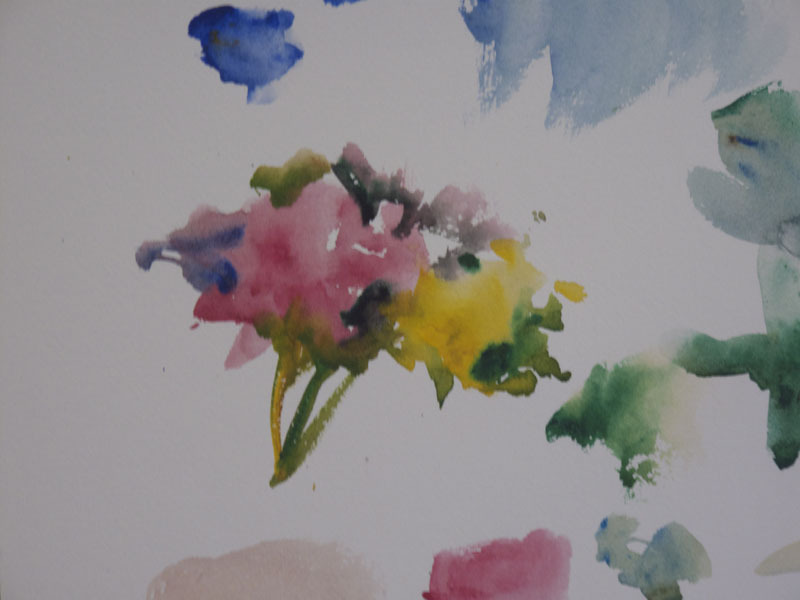 We then had a demonstration of what this meant in practice and how to get the balance right between hard and soft edges, plus combining colours wet into wet. In my view the two best books explaining these tecniques are the most recent `Watercolour Solutions' and the 2001 `Painting Flowers in Watercolour'. ALL his tecniques are fully explained, contour drawing, brushwork and paint mixing. The flower book is accompanied by two very good videos. The discussion became quite lively with him saying there were too many `strokers' amongst the students and many denied doing it. He is adamant you must not stroke with the point of the brush because, apart from anything else, it will quickly wear out. One student comment, very good humouredly, was that `we're all liars and strokers then'. This evoked a gust of laughter but he was getting his points across in a quite forceful way. I thought it was a very useful session and so did the others. We then departed for Trelice. When we arrived at Trelice the weather was still marginal. It was heavily overcast, some wind and very light drizzle. Only two or three had brought painting umbrellas, so the choice for others was paint and brave the elements or watch Charles. I elected to watch although this wasn't easy as you can see from the photograph. Those that painted in the morning suffered very light drizzle which accumulated on the paper and made painting a real problem, still several battled on. Charles, under his umbrella gave a masterclass in painting a complicated building in adverse conditions. First steps. The stone lion, which you can just see in front of him was the starting point together with one of the party who had set up much nearer the house. He made the lion much larger than the actual statue which was considerably worn.. When painting outdoors Charles draws a section then paints, draws then paints, not completing the drawing before painting. The rational for this is that conditions are always changing when outdoors. They didn't change much here but he still followed this procedure. Note how there are no large washes. Quite a lot of splashing! See how colour has been introduced into what is a largely gray building even though there is much texture in the walls. Variation at every turn and simplification. Considering the conditions it was a brilliant effort and one my wife thought excellent, when she saw the finished painting back at the hotel. The way the subject was tackled gave me (and others) considerable food for thought. He used his small Craig Young Sketchers box and Escoda 1214 Kolinsky retractables. He has tried Escoda in the last two years and likes them. The normal equivalent is the1212 series. After a break for lunch at the cafe in a converted barn people soon began to drift off back to the hotel, and by about 3.30pm that was it. There was no critique that night. It wasn't the best day of the course but had its moments.